Menstruation occurs on a monthly cycle throughout female reproductive life. Menarche (the first menstrual cycle) normally occurs between the ages of 11 and 15 and the menopause between the ages of 45 and 55. The normal duration of a single cycle is 21-35 days. In this article we will focus on the reproductive hormones, the ovarian cycle and the uterine cycle. The follicular phase marks the beginning of a new cycle as follicles (oocytes surrounded by stromal cells) begin to mature and prepare to release an oocyte. At the start of a new cycle (menses) there is little ovarian hormone production and the follicle begins to develop independently of gonadotropins or ovarian steroids. Due to the low steroid and inhibin levels, there is little negative feedback at the HPG axis resulting in an increase in FSH and LH levels. These stimulate follicle growth and oestrogen production. Only one dominant follicle can continue to maturity and complete each menstrual cycle. As oestrogen levels rise, negative feedback reduces FSH levels, and only one follicle can survive, with the other follicles forming polar bodies. Follicular oestrogen eventually becomes high enough to initiate positive feedback at the HPG axis, increasing levels of GnRH and gonadotrophins. However, the effect is only reflected in LH levels (the LH surge) due to the increased follicular inhibin, selectively inhibiting FSH production at the anterior pituitary. Granulosa cells become luteinised and express receptors for LH. In response to the LH surge, the follicle ruptures and the mature oocyte is assisted to the fallopian tube by fimbria. Here it remains viable for fertilisation for around 24 hours. Following ovulation, the follicle remains luteinised, secreting oestrogen and now also progesterone, reverting back to negative feedback on the HPG axis. This, together with inhibin (inhibits FSH) stalls the cycle in anticipation of fertilisation. The corpus luteum is the tissue in the ovary that forms at the site of a ruptured follicle following ovulation. It produces oestrogens, progesterone and inhibin to maintain conditions for fertilisation and implantation. At the end of the cycle, in the absence of fertilisation, the corpus luteum spontaneously regresses after 14 days. There is a significant fall in hormones, relieving negative feedback, resetting the HPG axis ready to begin the cycle again. If fertilisation occurs, the syncytiotrophoblast of the embryo produces human chorionic gonadotrophin (HcG), exerting a luteinising effect, maintaining the corpus luteum. It is supported by placental HcG and it produces hormones to support the pregnancy. At around 4 months of gestation, the placenta is capable of production of sufficient steroid hormone to control the HPG axis. Fig 2 – The ovarian cycle, characterised by changes in the levels of LH and FSH. Following menses, the proliferative phase runs alongside the follicular phase, preparing the reproductive tract for fertilisation and implantation. Oestrogen initiates fallopian tube formation, thickening of the endometrium, increased growth and motility of the myometrium and production of a thin alkaline cervical mucus (to facilitate sperm transport). 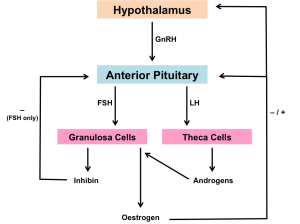 The secretory phase runs alongside the luteal phase. Progesterone stimulates further thickening of the endometrium into a glandular secretory form, further thickening of the myometrium, reduction of motility of the myometrium, thick acidic cervical mucus production (a hostile environment to prevent polyspermy), changes in mammary tissue and other metabolic changes. Menses marks the beginning of a new menstrual cycle. It occurs in the absence of fertilisation once the corpus luteum has broken down and the internal lining of the uterus is shed. Menstrual bleeding usually lasts between 2-7 days with 10-80ml blood loss. Fig 3 – The uterine cycle; menses, proliferative and secretory phases. What hormone is released from the hypothalamus? What is the effect of follicular inhibin in the follicular phase? How long does a mature oocyte roughly remain viable once released? What hormones are secreted by the corpus luteum? Which phase in the uterine cycle is stimulated by progesterone?